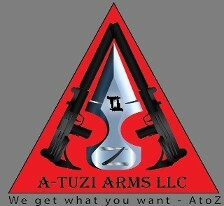 "We Get What You Want - A to Z"
A-TUZI ARMS LLC has access to multiple distributors of firearms and related accessories. Our customers are our top priority. Offering the best price and unparalleled service is our commitment to you. Shop with confidence. Here is a list of our featured distributors and links to browse inventory. We hope this list helps you LOCATE / RESEARCH your firearm or accessories so we can be sure to understand your needs. If you have suggestions about other sites to include, send us a message via the CONTACT US page. The Gallery of Guns site allows you to browse hundreds of firearms offered by many manufacturers. Simply search the database using keywords or categories and contact us for a price quote. The RSR site allows you to browse hundreds of firearms and accessories offered by many manufacturers. Simply search the database using keywords or categories and contact us for a price quote. Use the Adams Arms site to research gas piston systems, and Voodoo Industries options for you AR. The American Spirit Arms site has many innovative products to consider when customizing your AR. The infamous Jesse James has created his own versions of some of the most desireable fireams today. We are excited to have been granted access to Jesse's inventory and to be able to offer these awesome products to our customers. Dont Get Baffled. OSS has turned 100 year old suppressor technology upside down and inside out with their revolutionary design. CMMG features a lineup of AR style platforms built to accomodate an AK magazine full of 7.62x39!